Caterina Carbone and her husband, Mariano DiLisio, first appear in Fairport Harbor, Ohio, in 1918. In America, Caterina Carbone was known as Catherine Delisio. Caterina Carbone daughter of Pasquale Carbone, was born on December 14, 1888, at Roccacasale, Italy. She married Mariano DiLisio about 1911 at Ambridge, Beaver County, Pennsylvania. 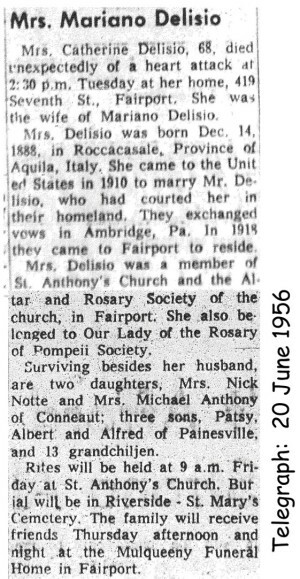 Caterina died on June 19, 1956 at 419 Seventh Street, Fairport Harbor, Lake County, Ohio, at age 67, of a heart attack. Her body was interred at Riverside Cemetery at Painesville, Lake County, Ohio. Caterina Carbone, age 21, immigrated to the United States on July 7, 1910, travelling to Ambridge, Pennsylvania, joining her father, Pasquale Carbone. Caterina Delisio became a citizen of the United States on June 20, 1927. She resided at 419 Seventh Street, Fairport Harbor, Lake County, Ohio, when she was Naturalized.